Mitsubishi’s latest addition to the GOT2000 range is the all new GT2107, now available. This 7″ widescreen HMI is a compact model with basic functions, a high resolution LCD and an attractive silver coloured bezel. Despite being a widescreen model, the overall dimensions of this HMI have been cleverly designed to be close to the previous 5.7″ models, making it much easier for customers to migrate with minimal redesign of systems machines. 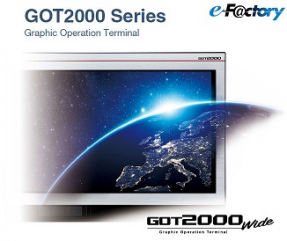 The GOT wide model satisfies your needs in various applications and supports remote access viewing via VNC. Click Here for full details and specifications.